The SONOS PLAYBAR wireless soundbar delivers sophisticated home theater acoustics and wirelessly streams all the music on earth through one streamlined, easy-to-use soundbar. With hidden speaker systems in planters and rocks as well as weatherproof LCD flat panels, your high quality media center can now follow you outside. Click here for the list of brands we support. Start with one room, then, expand anywhere to fill your home with wall-to-wall HiFi sound. Control all your music with free apps for your Android® smartphone, iPhone® or iPad®. 4K, UHD, LED, LCD screens - We provide and professionally install the latest flat panel technology to compliment your décor. We will put the "wow" factor in your custom home theater design. We specialize in family friendly home theater media rooms. Your new home theater can function in any room in your home from the living room, bedroom, den, basement, office, sunroom and even your backyard. Outdoor flat panels and soundscape for outdoor living. All Media specializes in listening to our clients needs and we will custom design a turnkey solution for you. We take the time to educate our customers and create the best custom solution for their homes. The ultimate control of the lighting in your home can add ambiance and security for your family. All Media provides state-of-the-art surveillance systems to help monitor your office and/or home. The placement of wires for audio, video, data and telephone lines are essential and cost effective when doing new or retrofit construction. Moving can be very stressful and costly. Did you know that home electronics have a higher chance of breakage than any other items during a move? All Media can uninstall your current equipment for your move and reinstall in your new home. How about an upgraded flat screen TV for your new family room? A WiFi booster can help the WiFi strength in your new home. Let us get your system and WiFi installed on your move in day. All Media has the experience to design and install an audio/visual system in your commercial office, retail store, conference rooms, patient waiting rooms and religious institutions. Whether it is background audio, information displays, conference room projector systems or surveillance monitoring, All Media can implement the perfect solution for your specific needs. We service Northern & Central NJ as well as NY Metro including Essex, Morris, Passaic, Bergen, Union and other counties. Our customers are located in Maplewood, Millburn, Short Hills, Chatham, Madison, Livingston, Basking Ridge, Bernardsville, Warren, Morristown and surrounding towns. (1) State-of-the-art trouble shooting: Upon request, we're now able to remotely monitor IP devices (Wi-Fi routers, IP enabled power supplies, Surveillance Systems, and more). We can be alerted to an issue and pro-actively fix problems before you even know it. (2) Annual check-up, technology consultation: A proactive way to ensure that all systems are in working order AND to keep you up-to-date on the latest available technology. (3) Unlimited technical phone or on-site service calls: If we can't solve any problem in person, we’ll be there in person. (4) Cancellation at any time: In the spirit of providing you with the service that you've come to expect from All Media Consultants, you can cancel the plan within 30 days, no questions asked. All Media Consultants offers lifestyle electronics, also known as "Smart Home" devices. Installing smart lighting, HVAC, window coverings, and a variety of other appliances allows for deeper control, automation, and remote Internet activation, as well as the use of a single universal remote to control all system functions. Design and create a theater room in your home to rival the very best movie theaters. All Media specializes in customized, unique solutions with cutting edge audio/video technology. We'll listen to you every step of the way to design your ultimate theater experience. Click here to learn more about custom media room design trends. Question: Why run wiring during framing of a house? 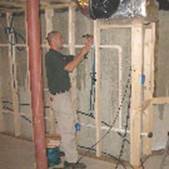 Answer: Once drywall and insulation are installed on your walls, it becomes very difficult and inconvenient to add the wiring and accessories necessary to operate many modern-day conveniences like home theater systems, computer networks, and satellite television without drilling unsightly holes in walls, ceilings, and floors. Once your house is constructed, often times it is impossible to run new wiring to the areas as you would like, forcing less than ideal system configurations and unsightly exposed wiring to achieve the setup you are after. When you pre-wire your home during construction, the homeowner has the benefits of a neat, clean installation, with the wires and controls being accessed in a control panel instead of creating a mess of the wall and ceilings usually needed in a retro-fit solution. When you let All Media Consultants handle the pre-wiring, you get reliability and attention to detail along with a technologically superior wiring system that is fully documented and mapped for future reference. Upgrading to new or different components in the future is made much easier, and even if you don't take advantage of the pre-wiring, it is in place and ready for future use. Think how valuable this might be to a prospective home buyer! 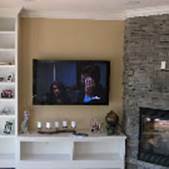 All Media Consultants can pre-wire for virtually any home theater, home entertainment, stereo system, ceiling speakers, home and office communication or video surveillance.